‘Domestic suspense’ is not a new genre, it’s been around at least since WW 2 but lately there have been quite a few thrillers coming out in this category and the term has become more in vogue. I think ‘psychological thriller’ may also be correct but it wouldn’t necessarily be set in the home. 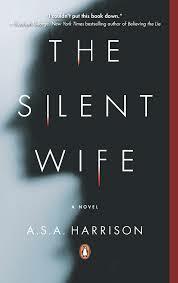 Domestic suspense takes an ordinary marriage or family relationship and begins to reveal that all may not be well. Hairline cracks appear that reveal a darkness and the reader becomes aware that there is evil at work. A sinister reality begins to emerge. The terror lies in the fact that this is no random crime in a dark distant alley, this wicked situation finds itself right under your own roof and there is no escape! I judge these types of books on three things, 1) good writing and character development, 2) the ability to build suspense, and 3) the inclusion of enticing twists and turns. It is usually skillful small reveals that best drive suspense, but a few gasp inducing surprises are just delicious in this type of work. The publishers’ hype of this novel (advertising blurbs, cover language) all lead one to believe that this is a domestic suspense novel along the lines of ‘Gone Girl’ by Gillian Flynn, but I don’t think it is. The story did not build suspense and there were not enough compelling twists. The psychological element was very well explored, so I would call it more of a psychological study. The dog’s name is Freud, so I guess that should have been my first clue. The story line is about a relationship that suffers for a number of reasons and at the outset you already know that she will kill him, you’re just waiting to find out when and how. 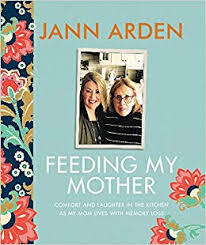 I did enjoy reading it, mostly because I felt fascinated by the behaviour of the main character Jodi when her “marriage” to philanderer Todd dissolves and things begin to fall apart. Her silence is the most chilling thing in the book. It contributes to her undoing, but also oddly to her pardon. Much like Mark Haddon’s autistic narrator Christopher in The Curious Incident of the Dog in the Night-time, Matthew in ‘The Shock of the Fall’ offers insight into the mind of a young person who is schizophrenic. Using images, letters, and different fonts, the narrator takes us on a journey through Mathew’s inner voices and different personalities. His brother Simon has Down’s Syndrome and dies early on in the story (this is not a spoiler, it’s right on the back of the book!) 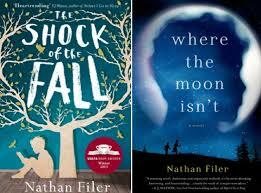 so the author explores how the family copes not only with mental illness, but also with grief. Writing a novel like this is ambitious and rightly won the Costa Book Award for 2013. Filer does a good job of sketching the life of someone suffering with mental illness, who depends on medications (with horrible side effects), has little opportunity for independence, and is constantly misunderstood. The author is himself a mental health nurse, so has obviously used his experiences and his observations to inform his writing. It is a heartrending account of a difficult life but written quite unsentimentally, as was Haddon’s. Both novels allow us unique insight into the mind of the protagonist, although I think Curious Incident was more readable because I felt Haddon was more skilled at building suspense. Not a huge fan of ghost stories, I was surprised to find myself reading a second one in only two months! This time for my book club. Both authors built fear using atmosphere, rain, wind, fog, and creepy characters. This one in particular used cold. Unfortunately the whole story left me a bit cold, and although I appreciated some good writing by the author and enjoyed the set up of a young married couple struggling in a post-war Yorkshire town, the whole possession of the greatcoat did not frighten me, in fact I found it rather dreamy and elegant which is a strange reaction, knowing it was meant to be spine-tingling! It is commonly understood that ghosts appear because of unfinished business – Alec did have a reason to haunt and Isabel had a reason to be haunted. An interesting twist (which I believe is the reason the story is not so scary) is that in this one, the ghost brings warmth and comfort instead of cold and terror! Although this book was published by Hammer, a horror publisher, most of Dunmore’s other books were published by Penguin and I suspect they are quite different from this one. 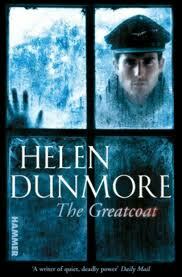 If you are a Helen Dunmore fan, I would appreciate knowing which one of hers I should read next. I fear this may not have been the best one to start with. I did appreciate her writing, I just didn’t enjoy the story all that much. I liked how she created the idea that history can be so powerful a force in our lives that it seems to somehow possess us and make its presence known. I liked how she described the loneliness and isolation of a young wife in a small rural town and how she skillfully revealed some hairline cracks in a new marriage. But that was about it. What a funny, original love story, very clever and entertaining. I enjoying it thoroughly. And finally, a romantic comedy from the guy’s point of view! Don Tillman is autistic and sees the world through the lens of logic without a lot of emotion because he is simply incapable of it. His brain is not wired that way. The subtleties of humour and sarcasm are lost on him, which is what makes the book hilarious (a bit like Sheldon in the The Big Bang Theory). He thrives in an atmosphere of routine, predictability, and of course science. When Don decides that it might be advantageous to acquire a partner, he sets out on the Wife Project. Of course the survey he devises as a means for finding a suitable candidate efficiently, is totally objective and meant to screen out people who smoke and drink, who are chronically late, overweight, vegetarian etc. But into his life walks Rosie, who meets none of the right criteria, but has quite an unexpected effect on him! When I did my usual research on the author, I was surprised by what I found. Before Graeme Simsion’s mid-life career change to novelist, he was an information technology consultant with a PhD! 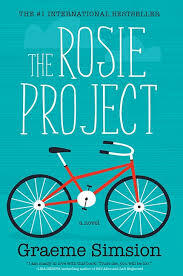 He decided to go into screenwriting which then led him into writing ‘The Rosie Project’. He found himself to be uniquely qualified in this new endeavour despite what the skeptics might say about going from technology to writing novels. Actually the processes and skills used in design theory for data-modelling transferred well to the writing, helping him with the construct of the novel. See his Ted Talk where he describes this a bit more. In an era when many people undergo mid-life career shifts, the story of the author is as compelling as the Rosie Project itself and is very encouraging. The creative elements you know in one field, can help you in a seemingly unrelated field if you are willing to think outside of the box and apply what you know to something new.